Part of going away to college is having the full college experience – laundry and all. But for students at Elon College in the late 1970s and early 1980s, this often-dreaded task of laundry was made a little easier. 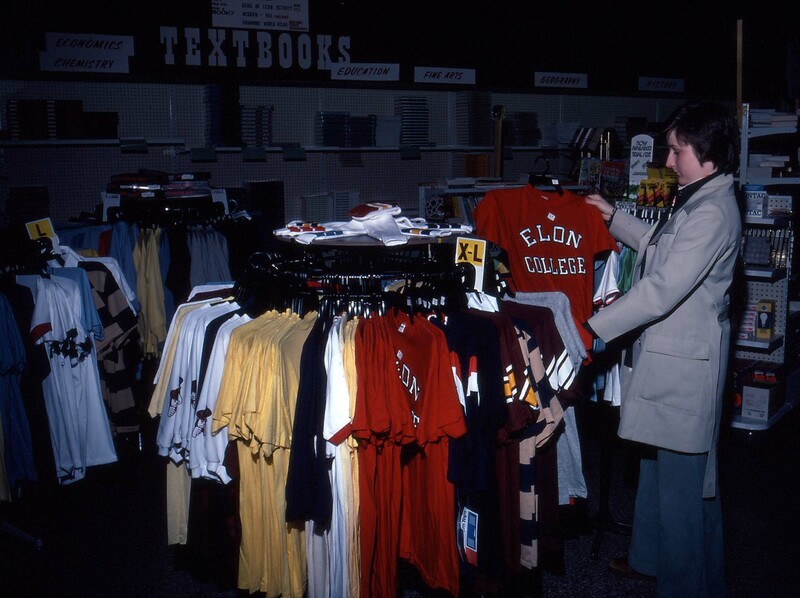 A student looks at clothing in the Campus Shop in 1976, which was located inside of Long. Buck Bayliff, the former manager of the Campus Shop, said that the cost was less than $50 per semester for students to use the service. Once a week students could bring in their dirty linens, such as towels and sheets, and pick up a set of clean ones. Originally, there was a storage closet in the Long Student Center where students could drop-off and pick up their linens. Eventually the staff in the campus shop had to move the drop off center to the loading dock at the Harper Center. Even though the linen service provided students an easy way to ensure that they would have clean towels and sheets, the students themselves were still responsible for making the beds. Bayliff recalls one mother who complained that her son’s bed had not been made after he received clean linens. Bayliff had to explain to the mother that the linen service did not provide a bed making service and this was something that the student would have to do on his own. Eventually, the service ended. The 1984-1985 Student Handbook was the last time the service was mentioned. Bayliff said part of the decrease in interest could be attributed to the fact that more washers and dryers were added around campus. Today, the campus shop does not offer a linen service and students do all of their laundry – linens and all.